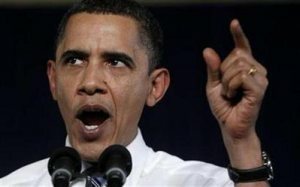 Why People Fear Protesting For Obama’s Impeachment/Removal | Stop Obama Now!! Obama dictates. Humans have been living with megalomaniac tyrants for hundreds and thousands of generations. When an extreme case appears on the scene who has many fanatical followers hell-bent on world transformation, there is is a natural survival instinct that causes opponents to keep their collective heads down and not directly challenge the messianic leader. At least in the beginning, you will find very few people, who are willing to take a public stand against the tyrant. In the last 100-150 years the mass psychology involved has become very well understood and propagandists — now called public relations experts — have learned how to manipulate the public by means of the media. Obama has many supporters in the entertainment industry, who understood very well how to make him a celebrity, loved and even, in effect, worshiped by millions.